The all-new Subaru Levorg goes on sale in Ireland this month, priced at €44,995. The new sport tourer model, which made its European debut at the Geneva Motor Show, has previously launched in Japan, where Subaru say that it has proved extremely popular with existing customers and created many new converts to the brand. A spiritual successor to the popular fourth-generation Subaru Legacy Tourer (2003-2008 ), the Levorg promises a compact on-road footprint, yet even greater interior space than its predecessor. The car will be available in a single GT trim package, with increasing levels of specification as standard, including Subaru’s iconic All-Wheel Drive (AWD ) drivetrain. 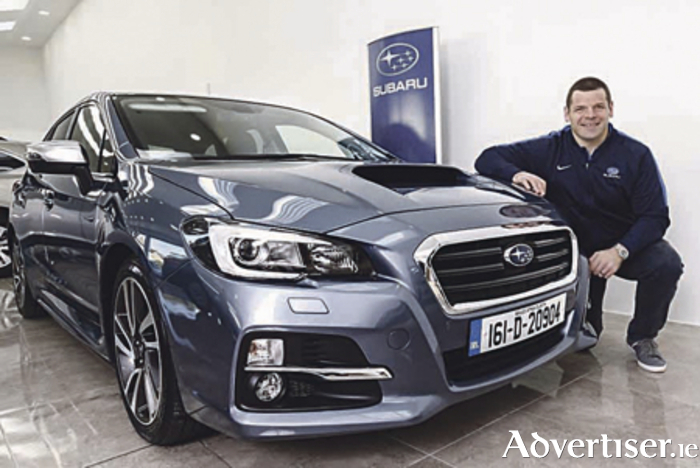 The new Levorg has a strong bodyshell and Subaru say that it also offers a wealth of active and passive safety technology The Levorg is powered by a newly developed 1.6-litre DIT (Direct Injection Turbo ) Boxer petrol engine, a signature format for the Japanese manufacturer. Paired with Subaru’s super-smooth Lineartronic (CVT ) transmission, Levorg offers a supremely refined powertrain. The new 1.6-litre DIT power unit delivers similar performance as Subaru’s existing 2.5L naturally aspirated Boxer engine, despite being 36 per cent smaller. Engineered specifically for its application in Levorg, the all-new four-cylinder engine produces 170 PS and 250 Nm torque. The all-new four-cylinder engine offers smooth, seamless power delivery and greater efficiency. Flexibility is core to its character, providing power over a wide range of engine speeds and perfectly matching the car’s remit as a sport tourer. The Levorg accelerates from 0 to 100kph in 8.9 seconds, while returning a fuel consumption statistic of 7.1 litres/100km (almost 40mpg ) on a combined cycle. Levorg is classified as VRT Band D.
With Subaru’s famous Symmetrical All-Wheel Drive system, Vehicle Dynamics Control and torque vectoring, the Levorg’s drivetrain provides unrivalled stability in all conditions. Subaru boasts that the Levorg’s sport tourer (estate ) body covers Subaru’s most refined interior yet. Subaru engineers and designers promise that the Levorg will offer one of the company’s most refined cabins ever, with a greater use of high quality materials. Leather-trimmed sports seats with unique to Levorg blue stitching will come as standard. Leather trim is used generously within the cabin, including the door trims, on the centre console, and on top of the multi-function display on the dashboard.